As your metal roofing Toronto experts, we guaranteeing you a lifetime of performance and durability out of your metal roof. As seen across the GTA’s growing number of steel roofs, the natural beauty contained in our products is second to none. As your roofing contractor in Toronto, we are the go-to resource for many residential and commercial customers in the installation of metal and steel roofs. Unlike traditional shingles, steel roofing will never split, warp, or rot, nor does it require routine maintenance or replacement. With steel roof panels in Toronto, you receive a high quality advanced roofing system. Every panel is optimized in texture and design. Interlocking with one another, the completed Toronto metal roofing installation is highly durable and attractive to the eye. Our company in the GTA offers an array of colours and a complete range of styles to choose from, ensuring that your roof matches the exterior and extended surroundings of your building. We strive to be the #1 roofing contractors in Toronto and in our commitment to achieving this goal, we’ve taken on only the best products in performance. In addition to the effectiveness of the product, compared to traditional products, you won’t be getting the weight that exists. This is great news in terms of being able to protect your property in times of heavy snow and ice. The lightweight steel roofing in Toronto is unequalled. After you have this steel roofing on your GTA home, you will never need to install another roof out of necessity. Steel roofing is not just a commercial trend but one that is becoming increasingly prominent on residential homes. 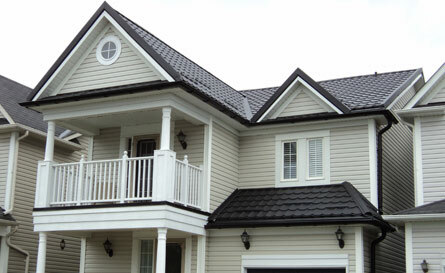 Many people choose metal roofing or steel roofing because of its superior strength, economic benefits, being lightweight, durability, easy installation and maintenance, weather resistance, heat and fire resistance, environmentally friendly, energy efficient, resistant to mold and mildew, and for its multi-decade product warranty. High quality steel roofing for residential, agricultural or commercial buildings can be found in our warehouse. Remember, when you buy into a steel or metal roof, you are helping to contribute to a greener future. Being environmentally and economically friendly is a large part of our business model but even going beyond that, these products really give excellent curb appeal. Also, the average asphalt shingle roof tends to last an average of 12 years at most before needing a replacement. A metal roof in Toronto or steel roof that has been properly installed should last well over fifty years! Throughout the past decade, we have built a reputation on quality metal and steel roof panel products. Any questions or concerns regarding any of our products, please feel free to get in touch and one of our knowledgeable staff would be happy to recommend the product best for your needs. We advise anyone looking for a roofing contractor in Toronto to visit our showroom where you can view our products in-person and speak to a member of our staff who would be happy to assist with any questions you may have.